When attempting to move teeth around, you may find yourself dealing with an "ankylosed tooth". An ankylosed tooth means the root of a tooth is permanently connected to the jaw. It cannot move because the tooth no longer has the protective periodontal ligament around it. The root of the tooth will then become permanently attached to the jaw bone. An ankylosed tooth looks exactly like a regular tooth, except that sometimes it may be higher or lower in the gum line. 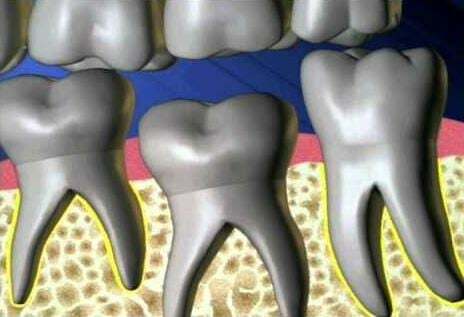 A tooth can become ankylosed while it is still growing out of the gums. When that happens, the tooth is usually shorter due to its growth having been halted mid process. Medically, it is not known exactly what causes a periodontal ligament to dissolve from around a tooth’s root and cause ankylosis—but something happens that damages the ligament. One of the suspected causes is dental trauma, particularly occlusal trauma. There are usually no symptoms or pain with a tooth becoming ankylosed and it is often discovered when examining a patient’s mouth, taking x-rays or when trying to use braces. The only way to handle an ankylosed tooth is to leave it where it is or remove it surgically. A patient can still get clear aligners if they have an ankylosed tooth. Just keep in mind that clear aligners will only move teeth that are not ankylosed. If a doctor suspects an ankylosed tooth, they can tap on the teeth with a dental mirror. The ankylosed tooth will have more of a solid sound when tapped compared to the dull, cushioned sound of other teeth. It can then be confirmed with X-rays.